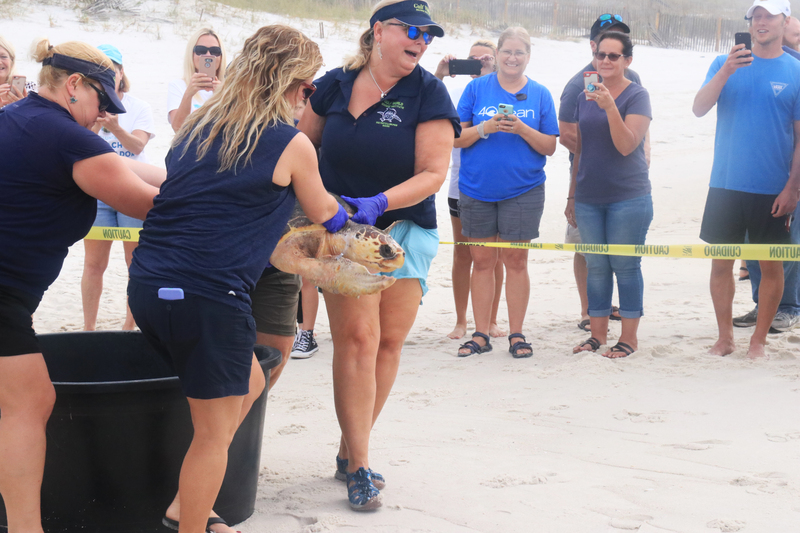 Two loggerhead sea turtles were released into the Gulf of Mexico on Wednesday, November 7th 2018 at 9:00 am at Beach Access 6 at South Walton Lakeshore Drive, Inlet Beach. Gamora was brought to Gulf World Marine Institute on May 19th, 2018 from Walton County, Florida. The animal was seen struggling to dive in the shallow surf by beachgoers. After arriving at GWMI, the veterinary team confirmed that Gamora had buoyancy control problems apparently due to some impaction of the gastrointestinal tract. Gamora regained control of her buoyancy as her gastrointestinal tract began functioning normally. The animal is now swimming and diving normally. Taserface was accidentally hooked by a fisherman at the M.B. Miller County Pier on June 14th, 2018. The pier contacted Gulf World Marine Institute immediately and the animal was brought back to GWMI. The sea turtle was debilitated at the time of the incident and the animal’s skin and carapace were covered in epibiota (organisms). The animal was placed on antibiotics and monitored closely. Taserface has developed a strong appetite and is swimming and diving normally. Both sea turtles were medically cleared for release.